The countertop in Matt Molina’s home kitchen is buried under a colorful spread that amounts to a small produce section: bunches of fresh mint, garlic cloves, hazelnuts and almonds hidden behind braised leeks. Center stage are two warm slabs of golden pane bianca, dimpled like a focaccia and glistening with olive oil. 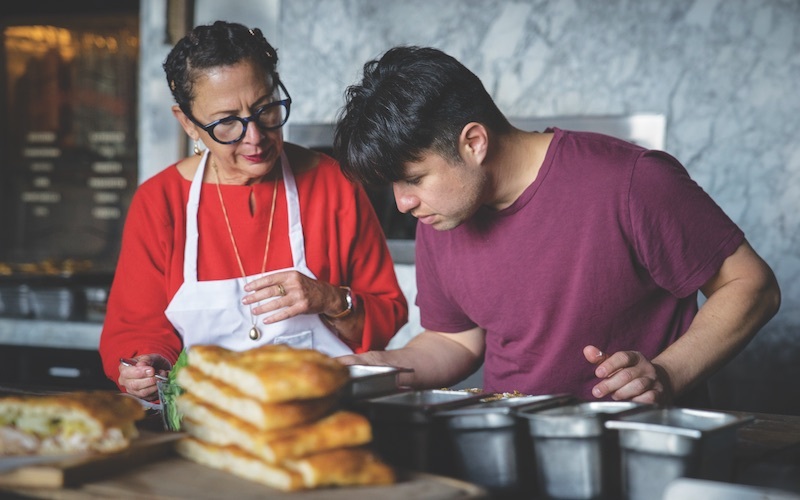 Overlooking the hectic mise en place are Molina, the chef at downtown’s Everson Royce Bar, and Nancy Silverton, the matriarch behind Mozza and founder of La Brea Bakery. In February, the two chefs, along with owners of Everson Royce, are opening Triple Beam in Highland Park, a walk-up pizzeria on Figueroa meant to evoke the kind you see in piazzas throughout Italy. Five-foot-long Roman-style pizzas will be displayed in the windows along the street. Square slices will be cut to order, weighed, and priced by the ounce. Today, though, the pair is focused on another task: developing sandwiches to complement the pizza at their casual takeaway spot. Molina and Silverton’s friendship dates back nearly two decades, from the days when he was a budding chef at Campanile, the landmark restaurant Silverton launched with her husband at the time, Mark Peel. Later came their lauded tenure at Osteria Mozza and Pizzeria Mozza, where Molina served as Silverton’s chef de cuisine (each netted a James Beard Award for Outstanding Chef). Molina departed the Mozzaplex in 2015 to open Everson Royce, but the chefs have remained close, waiting for the right time to reunite. “We have the same cooking style, and that’s why we work well together,” Silverton says, chopping capers and swirling them into a light-hued dijonnaise. “We cook by tasting. Spoonfuls of this and that, trying combinations you wouldn’t normally think to put together.” She pokes her head into Molina’s fridge. 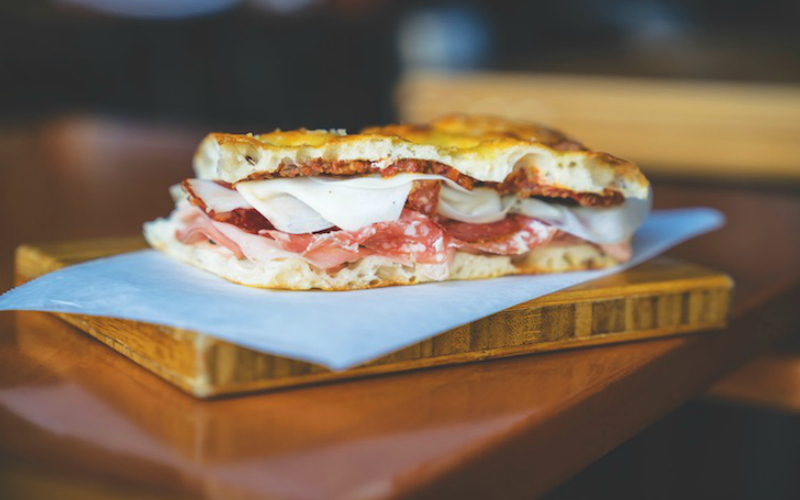 Inspiration comes from travel: Sandwich shops in Italy spurred the idea to serve pizza and simple panini. Cibrèo, a trattoria in Florence, inspired the coupling of eggplant with smoked mozzarella. The exception is the panino of turkey, pancetta, celery leaves, and truffle-flecked sottocenere cheese (the flavors reminded Molina of Thanksgiving stuffing). “It’s either rapini or arugula,” Silverton adds. “We can make a rapini pesto, or an arugula pesto, or a rapini-arugula pesto.” They ponder for a beat and jot down notes. “We’ll try that next time,” she says. Previous article100 Things You Can Do for Free in L.A.